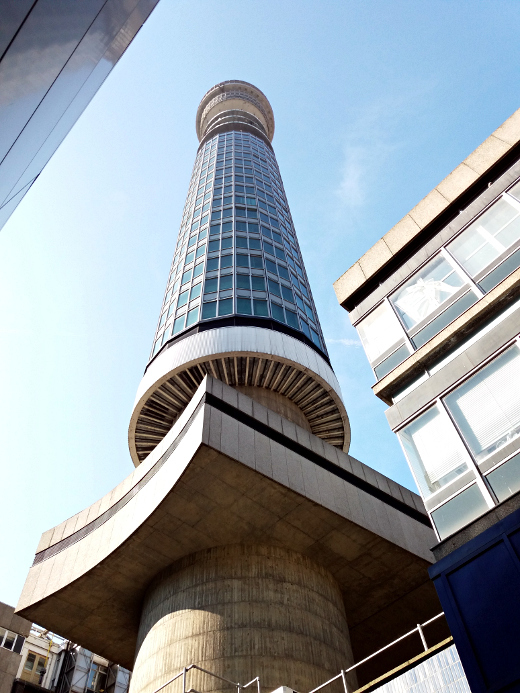 Last month I did some professional services work for an engineering firm at their premises right next to the BT Tower in London. 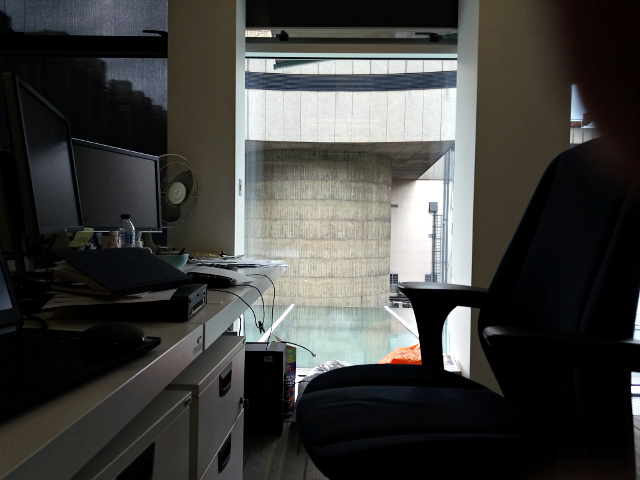 I was delighted to find that my desk was situated near a window with a direct view of its base. 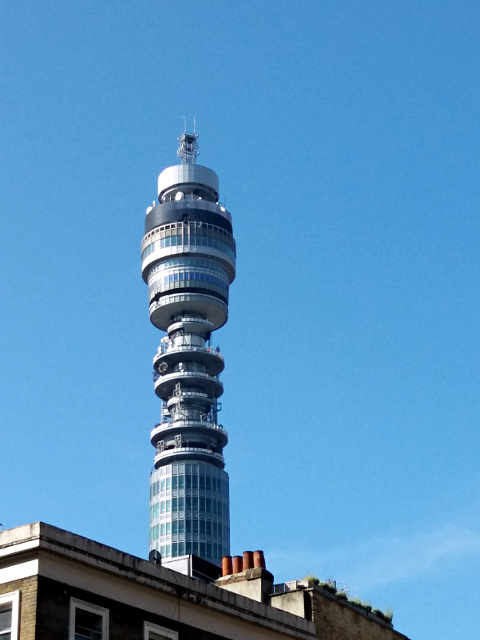 The Post Office Tower, as it was originally known, had quite a prominent place in British culture in the ’60s and ’70s when I was growing up and has always been my favourite London landmark. I well remember being thrilled to see it for the first time, looking out of a railway carriage window approaching Euston on my first visit to London at the age of 8. At that time it was the tallest building in Britain, and an important landmark of the capital city. Ten years later I visited London again. 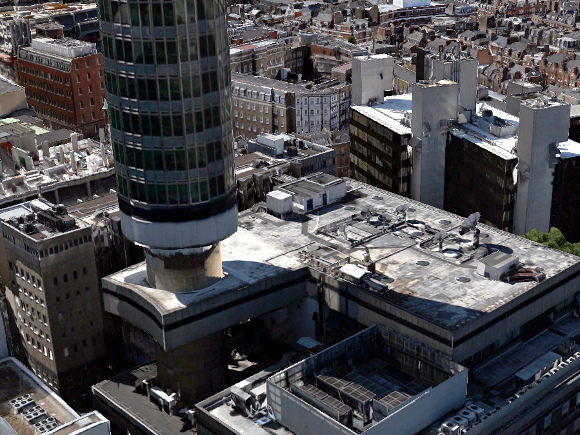 I stayed in a hotel on Tottenham Court Road, from where it was clearly visible, and one of the first things I did was to walk over for a closer look. I recall taking a few photos of it, though sadly I no longer have them. When I lived in London in the latter half of the 1990s I went to see it a few times, walking around the streets near its base and taking photos. It can be seen from a few parts of the West End. In its heyday in the late 1960s it had viewing galleries for the general public, a gift shop and even a revolving restaurant at the top. But it hasn’t been open to the public since 1981 and I’ve never been inside. 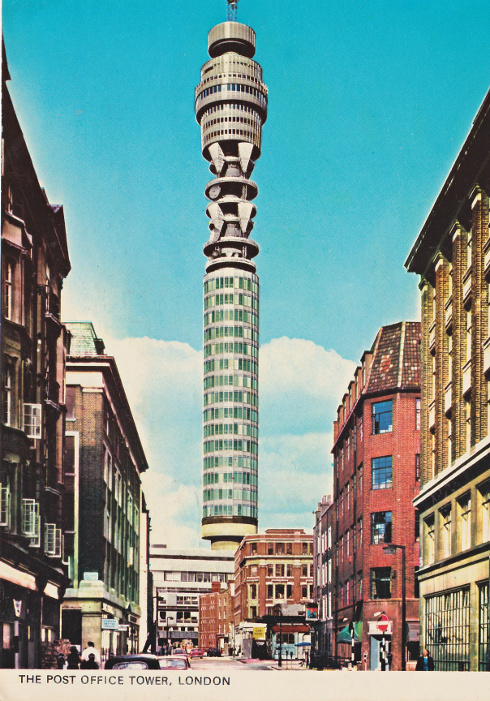 Below is an image from its 1960s heyday, taken at the junction of Clipstone Street and Great Portland Street, showing the tower in its original form. It was undoubtedly more visually appealing then than it is now. The triangular horn antennae which were an integral part of of its intended visual aesthetic were joined in the 1980s by a myriad of circular dish antennae, attached as if bolted on at random like headlamps on a mod’s Lambretta and somewhat spoiling its elegant lines. I took the following photo in June 2003. All of the large antennae have now been removed, as you can see from the following photo which I snapped on my phone last month. Their function has been replaced by subterranean fibre-optic circuits, and the upper part of the shaft looks rather undressed now. 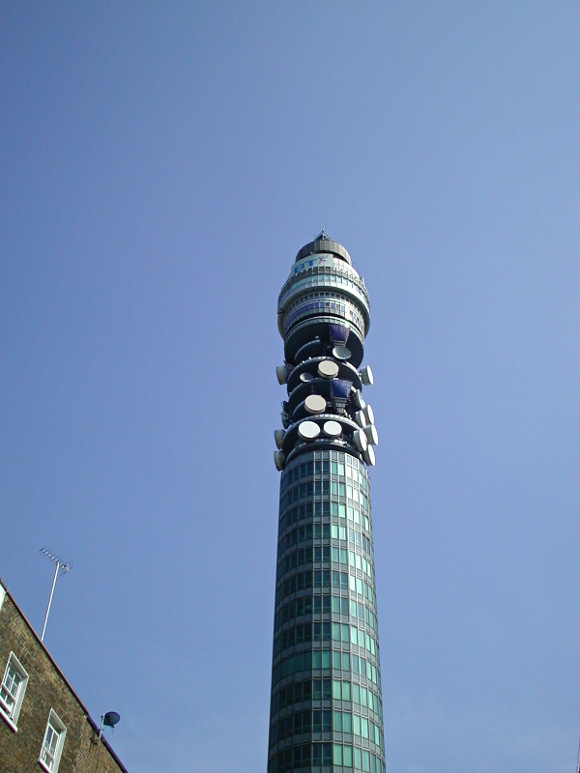 Despite this the tower retains its status as a major communications hub, carrying the majority of the UK’s outside broadcast TV material, for example. The tower was designed to remain as rigid as possible in high winds, because accurate alignment of the microwave antennae which were once an important part of its raison d’être was critically important in order for them to continue to function in all weathers, communicating with other stations, over and far beyond the hills surrounding London. To this end, its design incorporates a sort of “collar” in the form of a bridge deck, to anchor it to the exchange building near its base. The desk from which I worked in London last month had a good view of this, as you can see in the next image. I was fortunate enough to work on the top floor of One Canada Square at Canary Wharf, at the time the tallest habitable building in Europe, for a few months in 2000 and 2001. But I’d much rather have worked at the top of the Post Office Tower. Still, at least I had a good, if distant view of it from there. Finally, have a look at this YouTube video, a film made in 1967 about the construction of the tower. This entry was posted in Uncategorized on September 12, 2017 by admin.